Plain Yogurt Can be Made Tastier! Try This Out! In the era of fast forward life, somewhere we are compromising on our health. Staying fit and healthy has taken a back seat in our lives. While dealing with patients on an everyday basis, one common answer which everybody gives me for their illness is that ‘I don’t have time to eat in the morning so I usually skip having my breakfast’. Almost 90% of the patients walking into my clinic have the same excuse. If they would be healthier, certainly they wouldn’t enter a doctor’s clinic then! Some people have no time to cook and that’s the reason they are skipping meals. I was just wondering if I could help such people, and here I am- with my innovative mind, having innovative recipes that include yogurt. Let’s have a look at the recipes with yogurt that you can always prepare in a matter of minutes! Here Are Some Yogurt recipes To Help You Create A Healthy Magic For Your Taste Buds! Chop strawberries and add it to the plain yogurt. Grind it in the mixer. Add organic raw honey while mixing it. Pour it into the glass and top it with nuts. Beat the yogurt or home-made curd till it becomes creamy. Add 1 tbsp. of organic raw honey and beat the yogurt/curd again. Next, add finely chopped carrot, beetroot, and cucumber to the yogurt/curd. You can use this quick healthy spread as a healthy breakfast option! You can add seasonings and flavorings to the yogurt/curd as per your requirements. Take purred Kabuli channa (chickpeas) and add it to yogurt/home-made curd. Beat till it becomes a bit consistent. Add chopped garlic cloves, jeera powder and olive oil to the yogurt-chickpea mixture. Top it with 1 tbsp. of oil, pomegranate seeds/ chia seeds, and mint! This dip goes the best with wheat baked chips or nachos! The above-mentioned recipes with yogurt are sure to delight your taste buds while keeping you healthy at the same time! 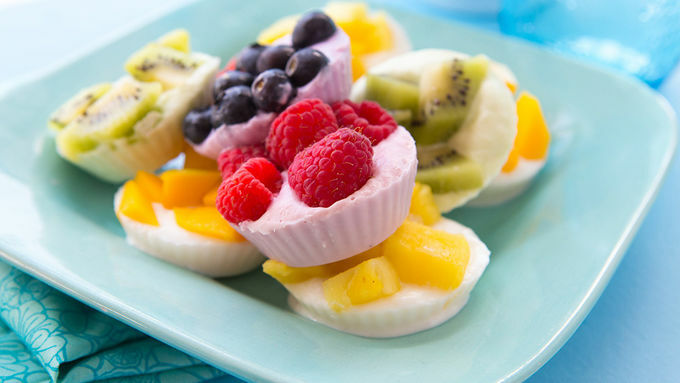 Try these Yogurt recipes to make your breakfast, lunch, dinner or dessert deliciously healthy and fun!